Multiple sources have reported that shortstop Deven Marrero (pictured, right), reliever Jonathan Aro, and outfielder Jackie Bradley Jr. are all present in the Red Sox locker room this morning, indicating that the club will purchase the contracts of Marrero and Aro for their first major league call-ups and recall Bradley from his option. Counter-moves have not yet been officially announced, but reports after John Farrell's media availability have right-hander Joe Kelly being optioned to Pawtucket (with Justin Masterson taking his spot in the rotation this Sunday) and second baseman Dustin Pedroia being placed on the disabled list, and catcher Erik Kratz being designated for assignment. It is not expected that left fielder Hanley Ramirez, who was also injured in Wednesday night's game, will need to join Pedroia on the DL, but swapping Bradley for Kratz will give the club an extra outfielder while Ramirez recovers from being hit in the hand with a batted ball while running the bases. Marrero was the Red Sox first-round draft pick in 2012 out of Arizona State. His strength has always been his defense, with tremendous fundamentals, range, and an above-average arm at shortstop. Offensively, he has gone through ups and downs in his professional career. In 2013, while playing for Portland, he had his first strong offensive output, hitting .291/.371/.433 over 68 games before being promoted to Pawtucket, where his production fell off. He has also struggled offensively to start this season, hitting .241 over his first 232 at-bats. 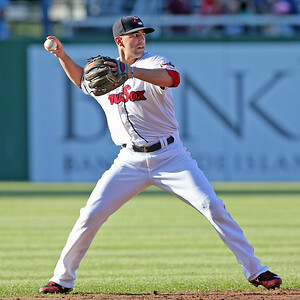 Although the Red Sox have taken the approach of exposing their Pawtucket position players to multiple spots on the diamond this season, Marrero has played second base in just five games as a professional, all taking place this season, as well as one game at third, making it likely that Brock Holt will see the bulk of the playing time at second while Pedroia is inactive. SoxProspects.com Scouting Director Ian Cundall wrote about what he has seen Marrero recently, noting some inconsistency on both sides of the ball. Aro (pictured, left) was signed in 2011 as an international free agent out of the Dominican Republic. He has pitched out of the bullpen for most of his professional career, often going multiple innings, including all but two of his 18 appearances in 2015. His stock has climbed very quickly over the last couple of years, as his performance has warranted several quick promotions. In 2013, he pitched the whole season for Lowell, then pitched for both Greenville and Salem in 2014, and in 2015 has already been promoted from Portland to Pawtucket and now to the majors. This year he has been especially dominant, with a 1.61 ERA and 0.81 WHIP over 22 1/3 innings for Pawtucket after starting the year by posting a 2.82 ERA for Portland. For more detailed scouting information on Aro, check out Cundall's report on high minors bullpen arms from earlier this season. Meanwhile, Bradley was called-up in May of this year and saw time in four major league games, going hitless in 11 at-bats with two walks. Despite the small sample of struggles in the majors this season, Bradley has done very well for Pawtucket, hitting .322/.398/.468 with four home runs and 18 doubles over 205 at-bats, bringing back memories of his success prior to his major league debut in 2013. 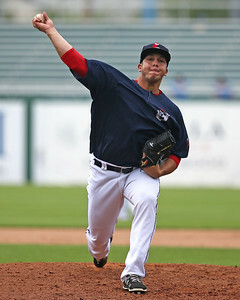 SoxProspects.com Assistant Director of Scouting Chaz Fiorino recently wrote up his assessment of Bradley and says that he has made significant strides. Photo Credit: Deven Marrero and Jonathan Aro by Kelly O'Connor.